United Nations, Sep 27 (IANS) Antigua and Barbuda has assured India that it will extradite fugitive jewellery merchant Mehul Choksi as soon as the legal formalities are over, according to External Affairs Ministry Spokesperson Raveesh Kumar. 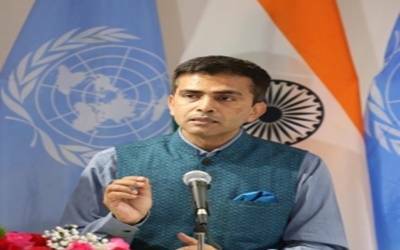 The assurance was conveyed by Antigua’s Foreign Minister Chet Greene when he met External Affairs Minister Sushma Swaraj on Wednesday on the sidelines of the UN General Assembly meeting, Kumar told reporters. Greene, who had requested the meeting, told her that Prime Minister Gaston Alfonso Browne and the government were fully behind complying with India’s request for extraditing Choksi, Kumar said. Sushma Swaraj asked that he be extradited expeditiously and Greene said there were internal legal and court procedures that had to be gone through to comply with the nation’s laws and as soon as they were taken care of Antigua would extradite him, according to Kumar. Choksi, who is wanted in India over his alleged involvement in a scheme that defrauded Punjab National Bank of $2 billion, has reportedly taken the citizenship of the Caribbean island nation.